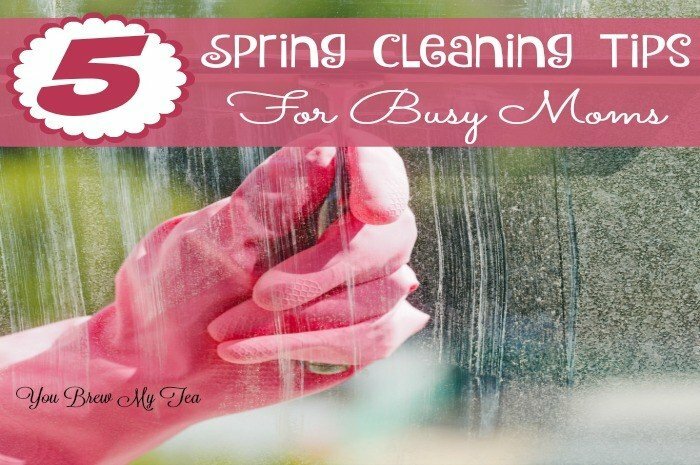 I’ve always loved the idea of Spring Cleaning and my spring cleaning tips are much needed for busy moms like you and me. It’s a way to get rid of all of the junk in the house and it means sunshine is on its way. However, cleaning with kids at home can be a true nightmare. Not to mention, I’m super busy, so it’s not always easy to get things situated and ready for cleaning. Over the years, I have found some tricks though and I hope they make spring cleaning easier for you like they have for me! Have your spouse take the kids somewhere: If I’m smack dab in the middle of Spring cleaning, I really like it when my husband takes the kids somewhere. This is one of my favorite Spring cleaning tips because sometimes it is the only way I can get the house cleaned. It’s not always for a super long period of time, but if the kids aren’t in the house, I can get so much more cleaned than ever before. Don’t expect too much: I’ve also learned that when spring cleaning with kids around, don’t expect too much. You can’t possibly get as much cleaning done as you want when your kids are all there. I always start doing one task and finish it before moving onto the next. If my kids have had enough with me trying to clean, then I just stop. No sense in fighting with my kids, all while trying to have a clean house. 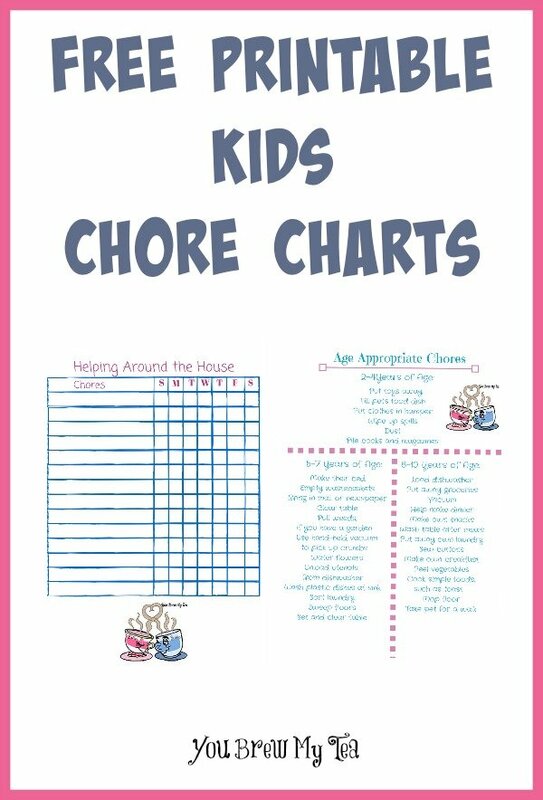 Clean as you go: One tip I’ve found very helpful while having little ones is to clean as I go. It’s much easier to spring clean while I do my regular cleaning. If I’m putting away laundry, I pull out the clothes that are too small. I even invested in a sorting hamper to help make that easier. If I’m doing dishes, I try and scrub the cupboards as I go using an all purpose cleaner and microfiber cloth. 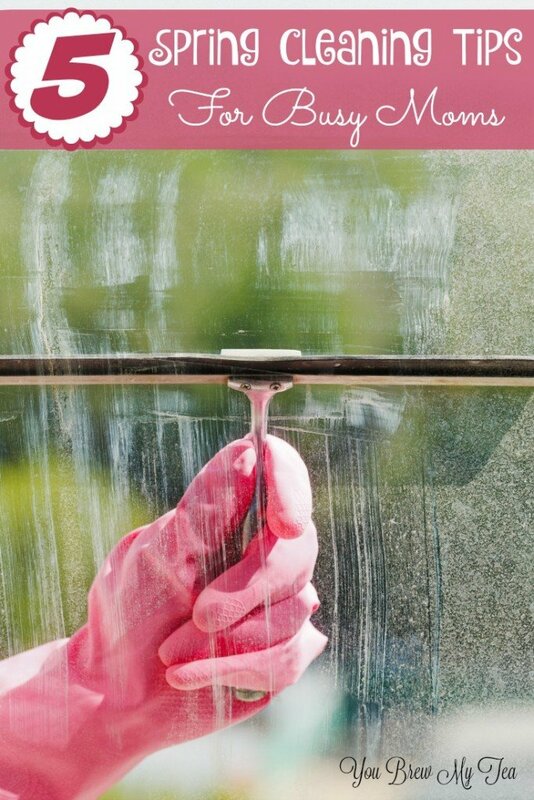 These little cleaning tips make it much easier to do a good deep clean later. Schedule in spring cleaning time: One tip you’ll want to take note of is to actually schedule in spring cleaning time. You know, put it on your calendar and in your phone. You certainly don’t want to forget to spring clean your home, especially since it makes your house look and feel so much better. It’s also the time of year you want to remember to check batteries in smoke detectors and do basic household updates like checking windows and doors for seals and scheduling a check-upfor your air conditioner. Ask for help: Yes, the dreaded “ask for help” is one of the best Spring cleaning tips. You’re only one person with multiple little ones running around, take the time to ask for help. And if all else fails, just hire someone else to do it. I’ve been known to hire help if I can’t get to the task. Why not? 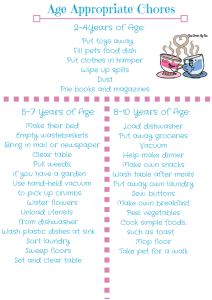 What tips do you have for spring cleaning as a busy mom? I’d love to hear your tips! Check out some of our other great cleaning and organization tips! You probably already know how much I (we) love to travel, so these Organizing Tips For Road Trips shouldn’t come as a surprise at all. When it comes to hitting the road with the guys, it’s so much easier when we are all on the same page and have things in order. 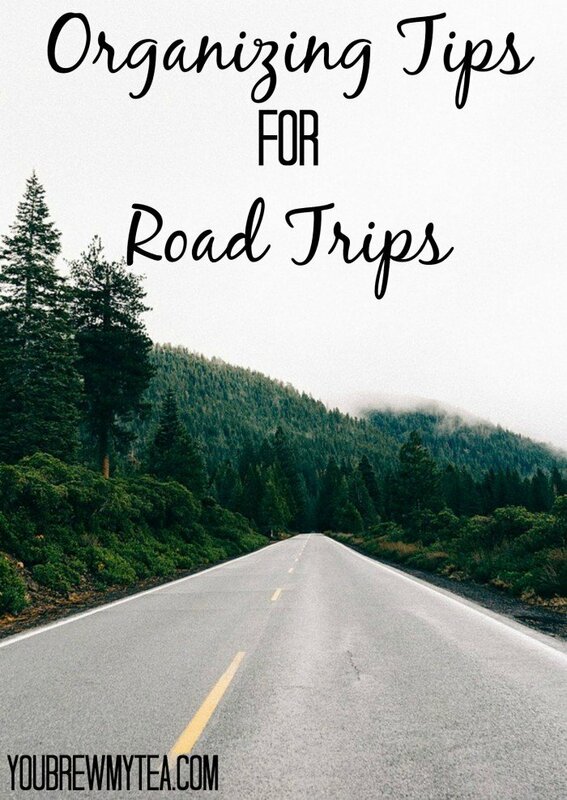 These tips definitely keep us going for those long trips like the 37 day cross country trip we took this summer. Pack your suitcases in kits. This works especially well for kids, but adults can benefit from it as well. Instead of just cramming everything into your bags, use large gallon Ziploc bags and put an outfit per bag into them. Pants, shirt, underwear and even jewelry can go into the bag for each day. Instead of trying to dig through clothes each day, you can simply grab a “kit” and take it to the bathroom to get ready. Do the same with your toiletries, makeup and even medications or hygiene items. This is perfect for the Wee Child since he can just grab a baggie and head to the bathroom instead of going through his whole suitcase. Color code travel bags so everyone knows what belongs to them. Don’t give everyone the same color luggage or carry on bag. Match bags to luggage and give everyone their own color. This helps everyone know what is theirs, and makes it easy to quickly count and see what might be missing. If everyone has 3 bags and there are 2 black bags instead of 3, it’s easy to send that singular person to retrieve their other bag. My bags are silver, the Wee Child has red and my Beau has black. So much easier to manage! Keep travel itineraries in every suitcase and carry on. Even though as a parent you don’t think your kids will ever look at your itinerary, keeping a copy in their bags as well as yours is a great idea. Should you ever get separated, you will all have copies of information including destinations, next hotel, telephone numbers and even an emergency contact back home should the need arise. We also add an itinerary to our wallets and one to the Wee Child’s hip pack (aka fanny pack). Give yourself an extra travel day before going back to work. When you plan your road trip, make sure to give yourself a buffer day. This means if you only have 7 days off work, make sure your trip gets you home by day 6. This gives you an extra day should an emergency come up, but also to unwind, unpack and get prepared for the back to work scenario. In other words – don’t over book yourself. Keep necessary items in travel bags near you instead of in the trunk. Much like you would take a carry on bag when flying, you want a carry on bag for road trips. Everyone should have a bag with things to occupy them, emergency medicine, comfort items, snacks and a copy of the itinerary. That could be a simple activity bag for the youngest, a backpack for teens with their video games, or a tote bag for mom with magazines, hand wipes and her craft projects. These organizing tips for road trips will help you to make the most of your next short or long vacation. In fact, these tips have been our standard over the last 5 years of traveling together as a family. With 3 cross country road trips, several weekend getaways and day trips galore it is not uncommon to see us loading our car and heading out to enjoy the road! Check out our other favorite travel tips! We live in an older home, and frankly the master bathroom is tiny. 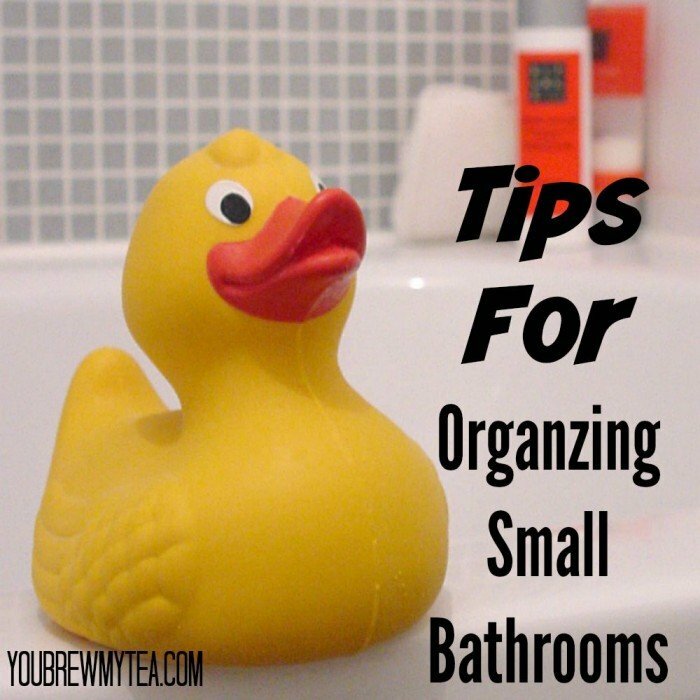 These tips for organizing small bathrooms have really helped me to keep things neat and orderly while not feeling so cramped. This helps me to manage until we can afford to move to a different location in the future. Our son has the larger of the two bathrooms in our home, and if the master bathroom wasn’t in suite, we would definitely be swapping him for it. We have a 3/4 master bath which means there is a shower and no bath. While it is functional for our needs it can be very frustrating to deal with. Being a smaller bathroom means we have to juggle to keep everything in place. Especially since we have only one drawer and very little cabinet space. 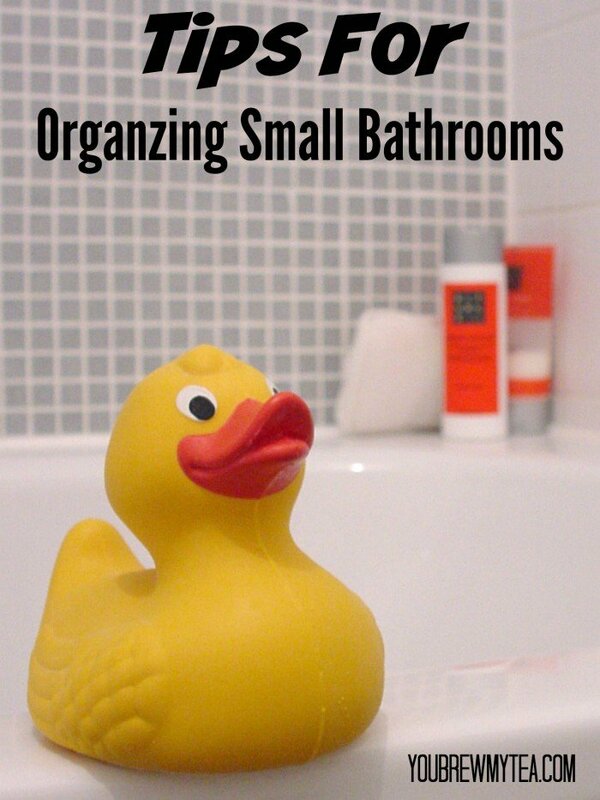 Here are some great tips for organizing small bathrooms on a budget. Use over toilet storage: In small bathrooms, using an over toilet storage unit that can go behind and above your toilet can make a huge difference. Storage shelves are my favorite since the open shelf gives you just a bit more room for storage. They are great for holding extra towels, washcloths, soaps and even just a nice decoration like a potted plant or candle. Streamline your product usage: If you are limited in the number of drawers or cabinets in your bathroom, it may be time to get rid of some of the extra stuff you have, “just in case” you might need it. Go through your makeup drawer and eliminate items that are more than 1 year old (including nail polish). Next you can go through what is left and choose just what you actually use on a regular basis. Change to a hair care product that has a mouse or gel with heat protectant included so you aren’t using two different products. You can even buy multi-purpose cleaning sprays so you aren’t storing multiple bottles under your bathroom sink. Store extra towels and supplies in a different area: Use your linen closet for things like extra towels, soap, shaving gel, razors, body wash and even your first aid kit. Keep items away from small children that should be locked up, but using a different part of your house to store them is a great solution to free up space in your small bathroom. Use the right in cabinet shelving: Inside your bathroom cabinets, you may have extra space to utilize that is currently being wasted. Add in an appropriate shelf and double your storage for items that are shorter in under sink cabinets. I like stacking shelf organizers for this purpose, but you could even use a can organizer if you preferred. Check out some other great organizing tips below! Do you come home from work and see a kitchen counter cluttered with dirty dishes, canisters and food? A lot of us struggle with how to stay on top of things like our kitchen being clean and orderly. If you have kids, work full time and want to have any family time – you quickly realize how tough it can be to keep everything done, arranged and accounted for. 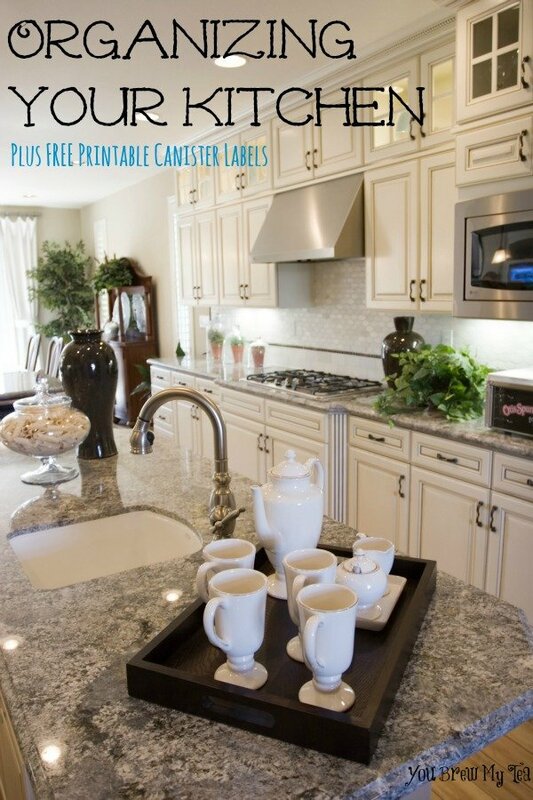 Here are some of my favorite tips for Organizing Your Kitchen Plus Free Printable Canister Labels our friend Katie F. made for us to share with you. Not only do we give you our tricks, we are going to give you something fun to update your kitchen with! Use Multi-Purpose Utensils: This is one of those things that is really hard for me. I am a gadget and utensil hoarder. I really love having all of those fun little tools in a drawer or canister just in case. I have 3 potato mashers in my kitchen. Why? Because one is plastic, one is metal and one has extremely small holes in it so it makes an even finer mash. I truly don’t need all three. I probably don’t need any at all considering how rarely I make mashed potatoes. My solution to extra clutter like mine? Find some great high quality utensils that you can use for multiple purposes. I believe a kitchen should have a handful of wooden spoons, a couple of nice spatulas, a whisk and tongues at the very least. Outside of that, look for things like dual purpose zester/grater so you aren’t housing both individual items in our kitchen. Grab a great food processor or mandolin that have multiple attachments instead of buying every dicer, slicer and chopper product around. Use Cabinet Door Storage: One of those tricks I learned many years ago from a dear friend, was to hang simple hooks inside a lot of my cabinet doors to store extra items. Things like measuring spoons and cups can slip onto hooks that will be out of the way, yet convenient on the back side of a cabinet door. She also kept all of her pot holders on a simple hook system inside the cabinet that housed her casserole dishes, baking sheets and cake pans. This way they were out of site, but always convenient when she started to use the oven. Don’t Allow It To Become The Junk Counter: School books, mail, magazines, recipes, cookbooks and empty packages often end up on kitchen counters. Make a household policy that this is not allowed. Kitchen counters are not to become the “junk drawer” of your home. Invest in a table for mail, book bags and keys to go outside your front or back door. Practice what you preach and always put your recipes and cookbooks away after using them. Make sure that trash goes to the trash can, and all food containers, boxes, ingredients go back in their proper place in the refrigerator or pantry. Work together as a family to keep your counters clear. Use Proper Storage Systems: There are tons of great canisters, containers and boxes you can set up in your kitchen, pantry or cabinetry to house your most commonly used items. Things like lazy susans are perfect for spices inside a smaller cabinet. Using canned good shelves in your pantry can save space and keep stock rotated well. 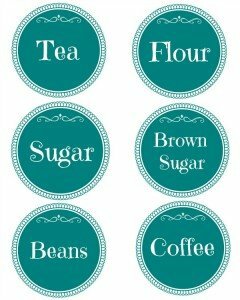 Simple, yet elegant canisters and air tight storage that is labeled well can keep your frequently used items like rice, flour, sugar and tea or coffee convenient and easy to recognize. 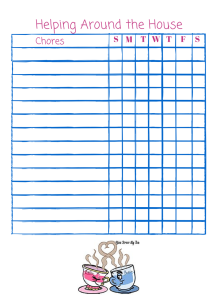 We even have these great FREE Printable Canister Labels to make your organization that much easier! Simply click on the image below and print these to use on your choice of great canisters, jars or storage containers. No matter how you go about organizing your kitchen – you need to remember that less is often more. Cutting back on unused items, labeling well and using alternate storage methods will be a great start to having a wonderfully clean, organized and easy to navigate kitchen. Don’t stress about the clutter. Toss the dishes into the dishwasher and settle in for a great movie night with the kids, or perhaps just a bubble bath and book for yourself. Want more great Organizing tips? Check out our other popular posts below!